Ideal to display close to a hand washing area to show your students how to wash their hands thoroughly. Select and download the school font and design (full colour, low colour or black and white) for your class. Print and laminate the poster. You may wish to enlarge the poster for printing and laminating. Display the poster in the classroom or close to a hand washing area. 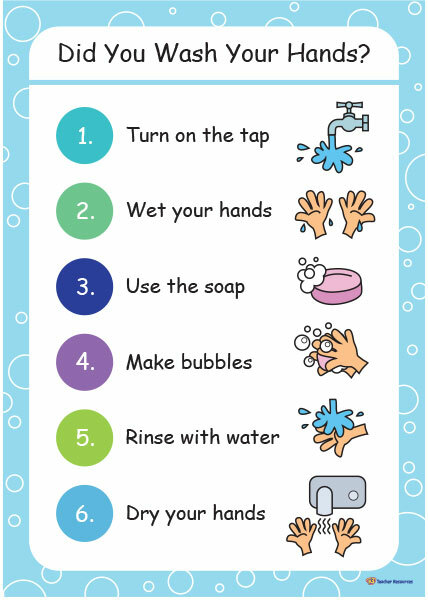 Encourage the children to refer to the poster when they are washing their hands. What comes next? – You may like to ask the students to create their own class poster. This is great. Any chance of a version with paper towel image for dry your hands please? Thanks for your comment and your request. We will take it into consideration. In the meantime, we hope that you and your class enjoy using this resource.